One picture each day. In reverse order. My very first 35mm was an Argus C3 that I bought used probably in 1960 or 61. In 1971 I loaned it to my brother for a trip to San Francisco. He left it in a taxi cab. While we were on vacation last week we stumbled across a store in Plymouth Wisconsin that carried lots of antiques. It was mostly clocks and dishes but I happened across this camera and just had to buy it. I don't plan to use it but I feel good just having it. Reminds me of my photography roots and especially my Mom, who taught me about photography. We even had our own black and white darkroom where I processed a lot of film from my Argus C3. 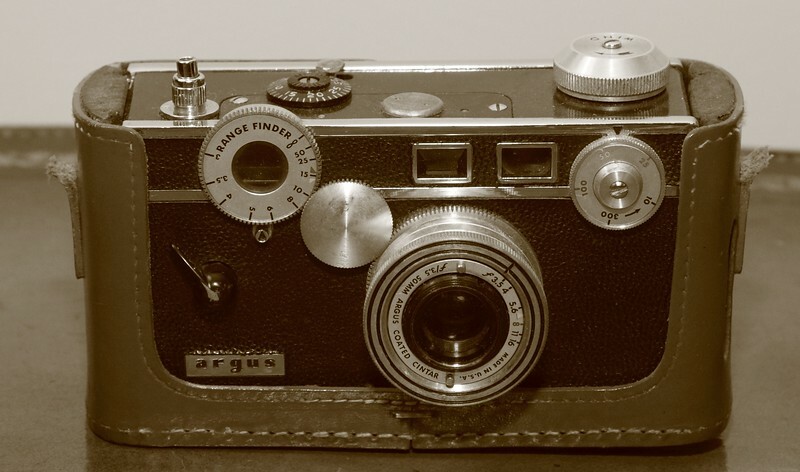 The Argus C3 was a low-priced rangefinder camera mass-produced from 1939 to 1966 by Argus in Ann Arbor, Michigan. The camera was the best-selling 35mm camera in the world for nearly three decades, and helped popularize the 35mm format. Thanks for the story behind the shot. The coloring used on this photo works well, thanks for sharing the photo and info. Terrific story and illustration. I can only imagine how devastated you must have been when you lost the original camera. Are you going to put this one to work ? What a classic! I have a few old cameras lying around from my parents and grandparents that I've been meaning to play around with. I think you SHOULD use it! What a great old camera and such nice memories.